How in the Nine Hells did I wind up in Neverwinter? This is how. TL;DR (and this is a damn long post) it’s all my husband’s fault, and now I’m obsessed. Prior to the early September release of Spider-Man, my husband was trying to find something play that would distract him from thinking about how much he want to play Spider-Man. Enter in a few YouTube videos concerning an anniversary somewhere within the realm of Dungeons & Dragons, of which he is a huge fan, and a storm started brewing. 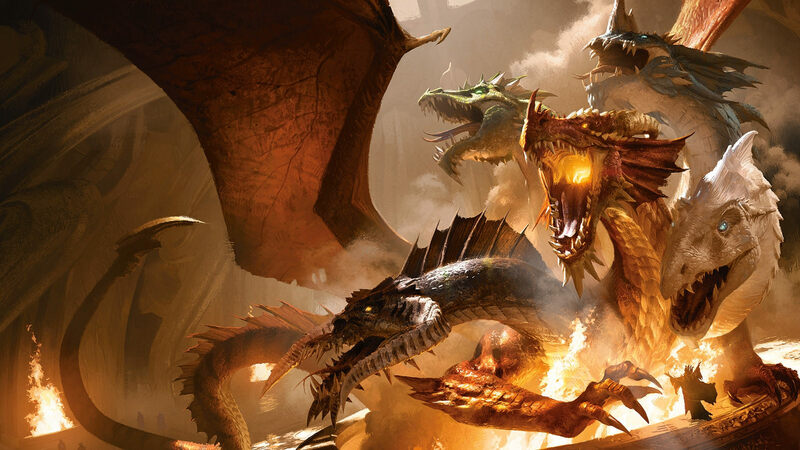 Further add to this him catching another bit of news about a new expansion to an old(ish) game called “Neverwinter,” which I quickly learn is a somewhat recent Dungeons & Dragons MMORPG, and it was settled. Neverwinter was going to be his jam until Spider-Man. So, onto his PS4 the game goes. He creates a character and starts playing. I catch initial snippets of the game here and there, and upon seeing that you’re almost immediately thrust into the game with other players — not that you play with them, but they exist on your screen, in the game — I immediately give it a mental thumbs-down. And the thumbs-down increased exponentially once he hit a certain level and was welcomed to the game’s main hub, which was brimming with random folks of all variety sitting and flitting about. But he appeared to be having a great time, and that was all that mattered. In fact, he had such a good time that he convinced an online friend to play with him. And so it went. And then, things changed. His friend’s interest in the game trailed off, and he was left to fend for himself. But he quickly discovered that he didn’t enjoy playing Neverwinter by himself. Frustration set in quickly, but he didn’t want to wholly give up. So he turned to me, and asked me to join him. 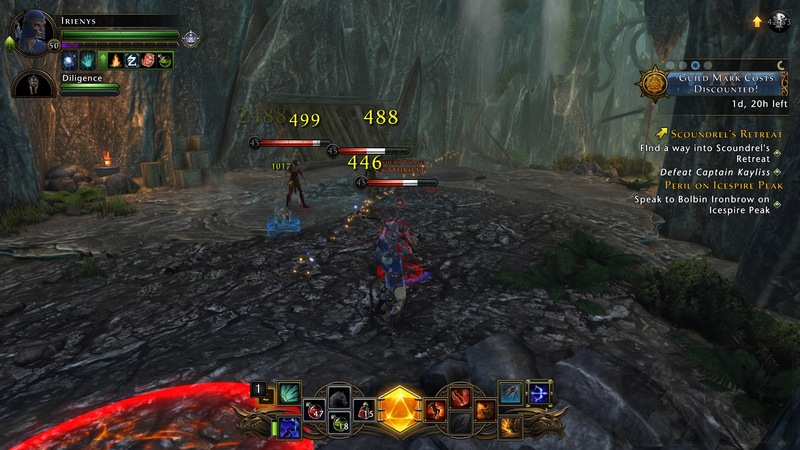 Up to this point, as I said, I caught the gist of Neverwinter, and I’d be lying if I said it didn’t kinda look like fun. Take the action-oriented and mission-based aspects of a game like Fable, combine them with the mechanics of deep lore-gathering like in Dragon Age, and the result is Neverwinter (for the most part). I love Fable and Dragon Age, therefore, I’d probably enjoy Neverwinter…if it weren’t for, y’know, the whole MMO thing, the thought of which made my stomach churn with anxiousness. I didn’t relent at first, primarily because we weren’t actually sure that we could play together, or that we even should. (Other than fighting games, we have a really bad track record concerning co-op games. In short, we don’t play them because we don’t want to kill each other.) But after setting aside the notion that we’d be doomed to fail, the question remained of if we could play together. And not from the home setup side — we each have our own PS4s connected to separate TVs — but rather from the online access side, with him as PS Plus member and me not. We both thought anyone wanting to play online through the PS had to be PS Plus members. So we took to the Internet, and joy of joys(? ), it turned out that Neverwinter was somehow open to anyone, including lowly non-online, but-I-hate-people plebeians like me. Well then, seems I didn’t have any excuse. While downloading the game, I did the scantest bit of research on character classes and races. My other half chose to be one of the game’s mage classes called a Control Wizard. If years of RPGing have taught me anything, it’s that pure magic classes can be among the most difficult to manage for new players. I therefore knew that I was likely going to head for the opposite end of the spectrum and play a warrior of some kind, probably a tank-y type to help keep my husband’s character out of the immediate fray. I picked the Oathbound Paladin class since in the few forums I explored, the OP was often named as a pretty easy class to pick up, and one great at hacking and slashing. (Sounded good to me!) I fiddled around with the game’s detailed character customization schema, named my female human paladin “Elorah,” and was ready to begin. I knew from my previous viewing of the game that new characters had to go through a couple tutorial levels, which not only set forth the basic mechanics of gameplay, but also set up the entire story. 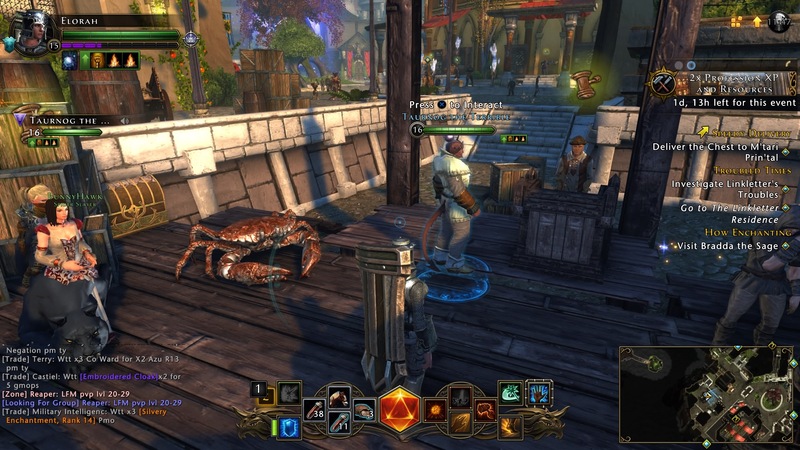 Neverwinter is in complete chaos after the disappearance of its last lord. As the dead rise and numerous monsters begin to take over the lands, the Lich Queen Valindra, alongside her dracolich (i.e. a lich’s dragon), makes a bold move to conquer Neverwinter. My character is tasked with aiding Neverwinter’s remaining military forces to help save its various regions from succumbing to Valindra’s evil plan. As with the way these things go, my character starts out with nothing, literally. She washes up on Neverwonter’s shores after a terrible shipwreck and is given only meager weaponry and armor. For the game’s first fifteen minutes or so, while I’m alone doing the tasks given to me, it’s clear that other people who are also starting the game are going through the same tasks…and man, do they make me feel nervous. Sure, the tasks are easy, but my stupid brain keeps telling me that I must look like the worst Neverwinter player in the world. All I want to do is stay out of everyone’s way…and I want everyone else to stay out of my way. Please for the love of god…please. I might very well have held my breath out of sheer nervousness until I reached a point where I was no longer “among others.” Where it was just me fighting, learning the ropes of all that my character could do. Where I could finally breathe the longest and largest sigh of relief mankind has ever known. Upon defeating the game’s first boss and attaining the grand level of “4,” my character is welcomed into game’s main hub, the Protector’s Enclave. I feel immensely overwhelmed as I start to explore, not only because the level is large, colorful, and teeming with life, but because much of that life consists of more random players than I’ve seen so far. Despite all the words I’ve typed, it’s hard for me to describe just how incredibly uncomfortable I felt in that moment. Real feelings of self-doubt, negativity, and “not belonging” flooded my emotions. Even though I have a breadcrumb trail to follow to my next objective, just running past random folks makes me feel awkward and awful. In sum, my state of mind was something like: Please don’t let them see that I really don’t know what I’m doing because I’ve never played an MMO in my life. The helpful, sparkly trail leads me to my first dungeon, and thankfully I’m alone again. As I make my way through the dimly lit area, I have an utter blast slicing through enemies and trying out the few special abilities my paladin has at her disposal. In the dungeon, I feel like I’m playing the best parts of Fable, exploring, growing stronger, gathering loot, uncovering secrets. Despite the dungeon’s linear layout, I spend what feels like an age in there, and eventually, it’s time to meet the dungeon’s boss. It’s a challenging but not difficult fight, one that results in me getting my first bit of real treasure. Not only that, but I hit level 5. Getting back the whole reason for me playing Neverwinter in the first place, at level 5 is when you can group with other players, which is the moment my husband’s jumps back in, ready to play. Aaaaaand…it only took us forever and a day to figure out how to play together. Lo and behold, soon enough, there we both are, a paladin and a wizard, adventuring together. And it’s…fun. Like really, truly enjoyable! My general discomfort, the “please ignore the non-MMO player behind the curtain” feeling subsides, and the game becomes all about us tackling quests together. 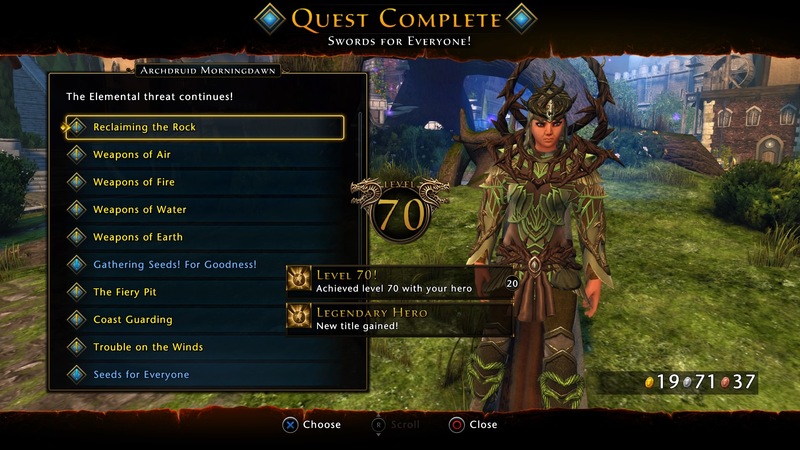 Understanding that it’s the quests that my husband enjoys over the story, we don’t spend much time delving into Neverwinter’s lore, but, on the upside, we do learn tons about various aspects of the game, from crafting to purchasing to inventory management to companions (players are allowed one NPC companion at level 16). We even try out a random queue where we end up playing in a group of five with three other folks. It’s embarrasing and weird (I’m not miked, and I can’t understand what people are screaming into my headset), but it’s not the absolute worst thing, and at least we were handsomely rewarded. On the downside, we also learn that some content requires three- or five-person teams for it to be accessible. But truly, the general quests are enough to keep us plenty busy. In short, we have a very pleasant time playing. Together we’re a powerful duo, what with the paladin as a near-tank and healer and the wizard with durable ranged attacks and buffs. And with that, my RPG bug had been set back in place. After getting my paladin up to level 29, I knew that I just could stop playing yet. I had to keep going. As soon as Spider-Man entered our house, my husband’s attention was completely diverted. And really, I couldn’t blame him once I saw just how amazing the game was. With him off swinging and web-slinging, did that my paladin high and dry…? Well, uh…technically, yes. I mean, we had been leveling up together, and he does want to come back to the game at some point (though with Spider-Man DLC on the way, I knew that wouldn’t be any time soon), so enter…the alt. 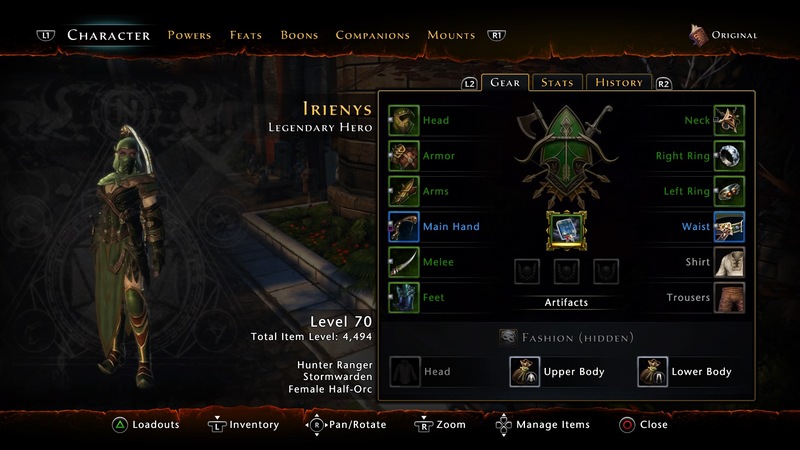 From the start, Neverwinter allows players to create two different characters to level up however you like. But before I dove back into the character creator, I had a question: could I truly play this game solo? Or more importantly, would I enjoy the game playing solo, or would my nerves get the best of me? The game tells you outright that “normal” content is playable by you and an NPC companion. But was that to be honestly believed? Well, yes, actually. Numerous forums indicated that you could totally play the game on your own, with many folks saying that they had gotten a bunch of solo characters up to level 70 (the game’s level cap) and they had a very fine time doing so. I still maintained an unflinching shred of fear over being hounded by other players, somehow called out for being unwanted and unfriendly and un-MMO-erly…but seriously, if they could do it, so could I. Before creating my new character I did a touch more research into the non-swordplay-based classes available, and I settle on the Hunter Ranger, an interesting class that allows for switching between ranged and melee attacks. For the character’s race, I choose a female half-orc with a talent for nature and survival. 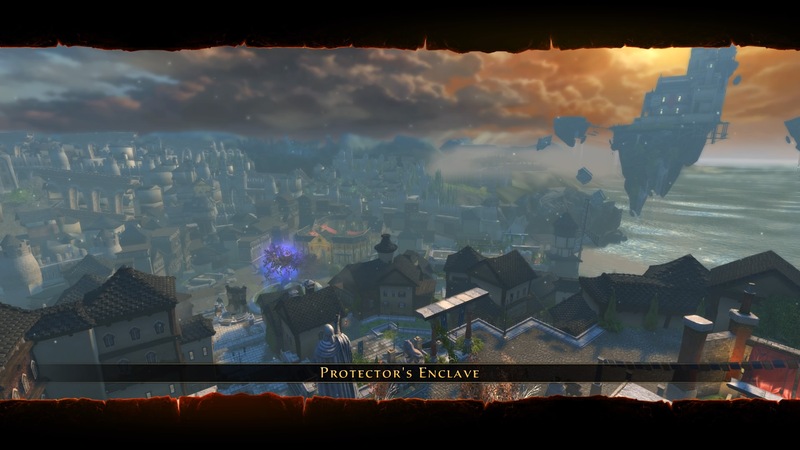 With my new character ready to go, off on my lone way I went, into the true wilds of Neverwinter. My Hunter Ranger is now level 70. I am have a damn good time in Neverwinter on my own. So there. There’s a lot about this game to enjoy. Discovering and uncovering its lore, alone, is enough to keep me busy, at least. Combat is simple and yet intensely fun. If the world seems too “crowded” with random people in the moment, I can move to a different server instance with fewer people (or maybe no people, like that one time I did in the Pirates’ Skyhold, and it was glorious.) Loot is plentiful if occasionally useless, and though it’s clear that the game wants you to spend money, you don’t get docked for not doing so. And probably more importantly than anything, the community seems like an okay place. Although I say that from the standpoint of someone who has interacted with exactly zero people, and I doubt that I will. I have received the rare invite to team up or join a guild, but I suspect they are unintentional, since the game makes it too easy (on purpose, I imagine) to accidentally “speak” to nearby players. There are also a lot of things about this game that I don’t yet understand. Like crazy mounts (A giant crab? A train?? ), or “dailies,” or transmuting items (I might be saying that wrong), or in-game currencies and financial transactions. I’ve paid for a couple things to get a sense of how money works in and affects the game, and…eh. I would like to support Neverwinter, but I don’t think that farming for currency or spending my own money to look “cool” are things I’m into. My sense now is none of that stuff really matters since I’m not playing with a guild or harbor any interest in PVP. Still, I’ve lots to learn. All this is not to say that I’ve handed over my life to Neverwinter (Red Dead 2 is still coming out, y’know), but as they say, “to everything, there is a season,” and this is my season of Neverwinter. Who’d thunk, right? Congrats on hitting level 70. I played this game briefly and found it fun. Like your hubbie I got distracted by other games though and haven’t gone back to it. I imagine Neverwinter is more fun to play with a pal, but I appreciate that it caters to solo players too. 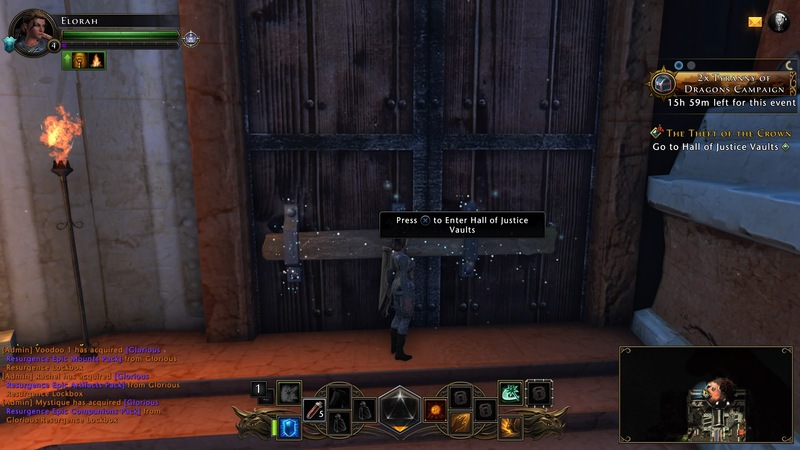 It really is great that it works both ways in Neverwinter. But, even when you’re with another player, you still kinda of play the game solo. Like, you each still have to complete the elements whatever mission your tackling together. Grouping does make for really fun combat, and it’s certainly helpful when facing dungeon bosses. What I really like about the game is that it gives you a lot of leeway in choosing how and what you want to play. That flexibility is key, and I imagine it’s something that’s helped the game flourish over the past several years. Great post, really enjoyed this. I’ve played a few MMOs over the years but have never quite made it to max level in any of them. I often solo or play with close friends, but I find the occasional interaction with randoms to be fun. Also, on a very superficial level, I love that when I get a cool piece of gear it will be seen by others, hah. Thanks for reading! 🙂 I will admit that in Neverwinter I have, on occasion, done some “people watching” while in the midst of a crowded server. It’s interesting to see how others have adorned themselves and what companions/mounts they’ve chosen. I also like that there’s definite mix of folks who’ve chosen the get all the bling, and others, like me, who are sticking with the “free stuff” route. I’m not yet ready to start playing with other people, but after trying a few of the tougher dungeons by myself, I see the draw. But for now, I’m having a blast on my own.